Jose Reyes cards have been on something of a roller coaster ride in recent years. At one point, they were among the hottest in the hobby. But injuries and lower numbers kicked in, not to mention leaving a big-market team for a much smaller market. Reyes has shown he has the potential to be one of baseball's most explosive players. He was one of the few bright spots for the Mets during an otherwise bleak period. In less than a decade, the speedy shortstop is already the club's all-time leader in runs and stolen bases. He left the team following the 2011 season, signing a free agent deal with the Miami Marlins. He was intended to be the face of the overhauled club (at least once Albert Pujols opted to go to Los Angeles). But it wasn't meant to be. Reyes was part of a blockbuster deal between Miami and the Toronto Blue Jays. 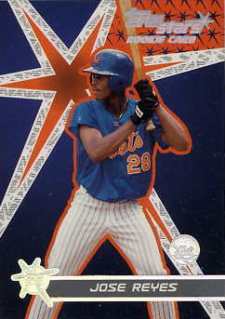 Reyes began his professional career after signing as a free agent out of the Dominican Republic in 1999. 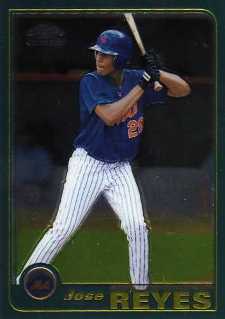 He worked his way through the Mets system over the next few years before debuting with the team in June, 2003. Still very young, Reyes continued to develop and get better. He's already led the National League in stolen bases three times, triples three times and hits once. Reyes' development was stalled slightly in 2009 when injuries limited him to just 36 games. Although 2010 wasn't his greatest, he's rebounded with an MVP-caliber year so far in 2011. He's also been the center of much trade speculation as he's eligible to become free agent after the season. Ownership uncertainty and debt has further complicated matters. Reyes has rookie cards in just a handful of 2001 Topps products. If you're looking to acquire them by busting old wax, be prepared to pay huge amounts. Albert Pujols and Ichiro Suzuki rookie cards are also in many of the same sets. 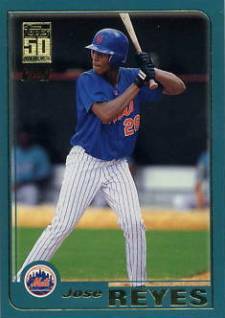 Reyes' first cards are reasonably priced and lack the gimmicks many modern rookies have. None are autographed or have memorabilia swatches. Only his 2001 Finest Baseball card is serial numbered. 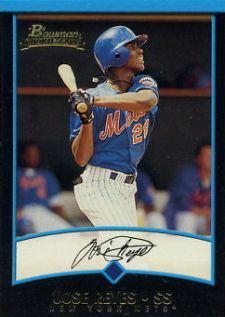 A solid low- to mid-end choice, Reyes' 2001 Bowman Baseball card shows the shortstop at the end of his swing, presumably watching the ball fly. As common as this pose is on baseball cards, this one's got a little more going for it. Reyes shows charisma in his face and his mid-air necklace captures a more in-the-moment feel. The black borders make this one somewhat condition sensitive so collectors may want to be a little more careful when buying ungraded copies online. The only parallel of the card is Bowman Gold, a one-per-pack insert that is largely ignored in the hobby. This is essentially a shiny version of the 2001 Bowman card with the same picture and design. As with all 2001 Bowman Chrome Baseball rookies, it uses Refractor technology. So if you find a seller that is marking it up as a more desirable parallel, it's not. It is a short print, though, just like all the rookies in the release. Parallels include X-Fractors and Gold Refractors. Gold Refractors are serial numbered out of 99 and are considered the crown jewel of all first-year Reyes cards. 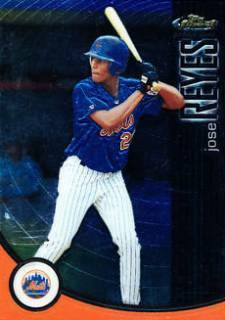 Reyes' 2001 Finest Baseball card is his only rookie that's serial numbered. Limited to 999 numbered copies, it's somewhat difficult to find. It pictures a wiry Reyes standing at the plate on a dark design. At this point, the Finest brand was overshadowed by Bowman Chrome, making this card overlooked in many ways. If it weren't for the serial number, this card would be even more ignored. The Refractor parallel (#/241) is another limited option that brightens the card up significantly. Another entry-level choice, this card doesn't cost much. Topps had a solid design in 2001. The green borders, gold foil and 50th Anniversary logo give it a classy feel. Unfortunately, the photo used for the rookie is boring. In fact, it's the same picture used on Reyes' Finest rookie. The card has a Gold parallel numbered to 2001 copies. 2001 Topps Chrome Traded was released in the same packs of 2001 Topps Traded. The Chrome cards were more limited and look like a parallel. However, it's considered a separate set as it continues the season's standalone Chrome set. Although more costly than the regular Topps Traded card, this one's still reasonably priced. Retrofractors were the only parallel for this set. 2001 was the last year for the insignificant Topps Stars brand. Introduced in 1997 as a hobby-only set with perceived rarity, collectors didn't seem to care. By the time 2001 came along, the brand changed concepts almost every year but none caught on with collectors. 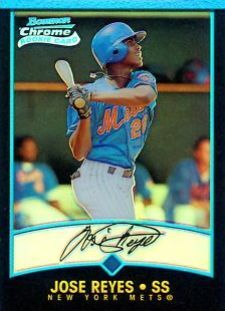 Not surprisingly, Reyes' 2001 Topps Stars Baseball rookie card doesn't carry a lot of significance. It features a Reyes standing in nearly the same pose shown on his Finest, Topps Traded and Topps Chrome Traded. Rather than a field, the background has an overpowering star. Perhaps the only real saving grace for this set are the two serial numbered parallels: Gold (#/499) and Onyx (#/99). Why is jose wearing 28?I thought his rookie year was 2003?